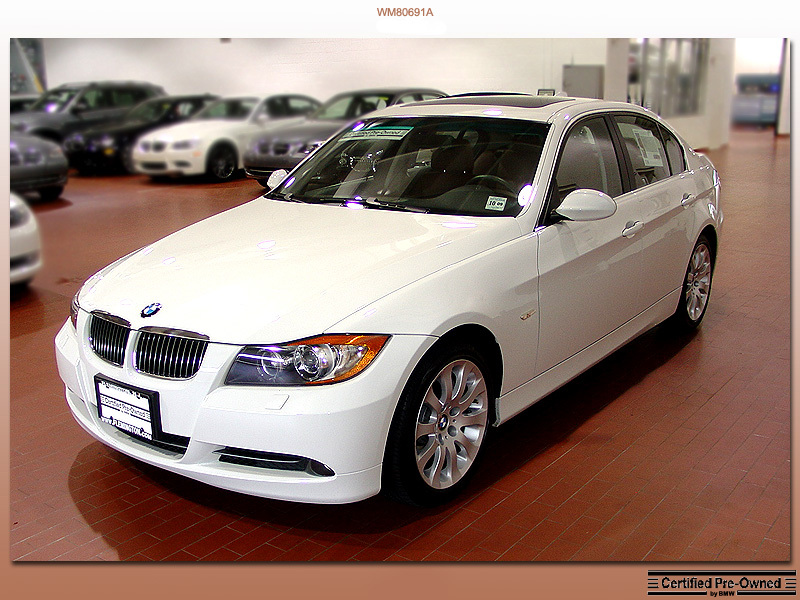 2006 330xi, bavarian white, chestnut brown leather interior, premium and cold packages, nav, CPO and 42k miles. I believe the price out the door was somewhere in the low 30’s. I was coming to this AWD version of the biggest engine regular 3 series E90 directly from it’s E46 ancestor (albeit in a round about way), so the comparison was bound to be interesting! I’ll focus on the important differences. From a build and materials quality perspective, I found the E90 to be superior to the E46. I know some do not agree, but it struck me immediately upon entering the cabin that it was a more upscale design, with better looking materials, and over time I found that it wore just as well (we put about equal time and mileage on these two cars). As has been the case with each successive generation of 3 series, the E90 is a bit bigger. This is a trend I find unfortunate and it may ultimately push us to the 1! The E90 isn’t too big though, and while the E46 absolutely does feel noticeably smaller, lighter and more intimate, the E90 manages to stay truer to that design than something like an A4 or a C class Benz (which to my sensibilities are really inching towards midsize). Ergonomics evolved well and were as excellent as always with logical layouts, good feeling switch gear all within reach, a fantastic driving position and firm supportive seats. The gadgetry moved up a bit, as befits time marching on, and for me it was much appreciated. I’ve reached the point where I really need things like bluetooth, onboard diagnostic computers, high end sound systems, and integrated nav and data services. The premium and cold packages are a staple, as far as I’m concerned, and all of the power equipment worked as expected. Inside the cabin I would say that the E90 is superior to the E46. Outside, on the other hand, is much more subjective. I can say that the E90 grew on me over time, and eventually caused the E46 to look dated to my eye. I do still love how small that car is though. The E90 definitely looks larger and bulkier. The Bangle flame sculpting is really at it’s best, and most subtle, in this 3 series and also it’s most effective. The design is clean and edgy and modern and yet still evocative of it’s heritage. I came to prefer to the E46, but I understand how some might now. Quality wise it fares better. I found the paint to be even better than on the E46 (which was excellent, in my opinion, as modern cars go), and the panel fitment was spot on. So we’ve established that the E90 is bigger and inside the cabin feels bigger than the E46, but is it noticeable when driving? The answer to this is yes and no. There is no doubt that the increased size is noticeable whether you are cruising down the highway, slaloming through the curves, or tooling around the suburban sprawl, but I feel that this size difference doesn’t detract from the experience. The E90 experience is still an intimate one. Throttle response and straight line performance are improved, while steering, braking and cornering are as good as ever (and superior in the absolute numbers). BMW has really never stepped backwards with the 3 series, being fully objective, so to the vast majority of drivers the E90 will strike them as a full evolutionary improvement over the E46, which is a really impressive thing. No issues with the 330. It was rock solid and made it through snowy winters and hot summers with nothing more than regular maintenance. Incidentally, I didn’t really detect any significant differences with X-drive. It is probable that even back in 2001, the BMW system was sufficient to deal with the type of winter driving these cars were likely to do. It is also possible that some of the road holding improvement I detected is due to superior tuning of the AWD system for the dry. The conclusion here is simple. I’m a big 3 series fan and the 06 330xi reaffirmed that. When it was time to let her go, it wasn’t out of dissatisfaction, but more a result of just how incredible the 335 turned out to be. But that’s a story for the next entry!